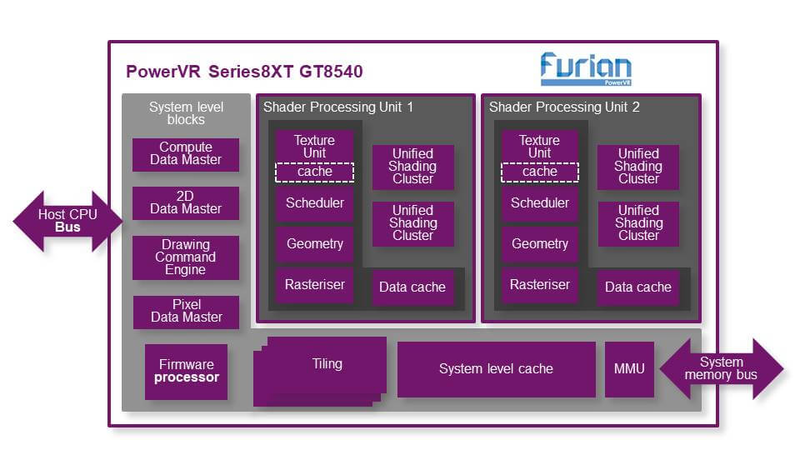 Imagination Technologies introduces PowerVR Furian architecture last year with improved performance, power and density, as well as dual cluster PowerVR Series8XT GT8525 GPU based on the new architecture, and targeting high-end smartphones, virtual reality and automotive products. 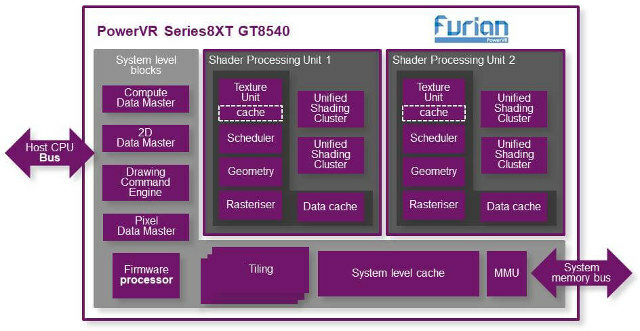 The company has now introduced a quad cluster Furian GPU called PowerVR Series8XT GT8540 that can simultaneously drive up to six 4K screens at 60fps thanks to an 80% fillrate density improvement, and supports virtualization providing separation of services and applications. The new GPU mostly targets the automotive market with some new cars now requiring multiple screen support with high resolution displays for cluster, Head-Up Display (HUD) and infotainment. The Series8XT GT8540 can support long-running compute workloads on a single Shader Processing Unit (SPU) for ADAS functions such as lane departure warning, blind-spot detection, and surround view, amongst others. Other tasks, such as infotainment and cluster, can run on the second SPU, using prioritizing mechanisms to reach system performance targets. The video below illustrates the principle with the always running dashboard, with a navigation app crashing and rebooting in a separate display. The GPU can also prioritize resources for one of the display. This type of process separation is not new though, as we previously covered a dual display automotive demo on NXP i.MX 6 using Mentor Embedded Hypervisor in 2013, but the Furian GPUs can support hardware virtualization so overhead should be lower. The PowerVR Series 8XT GT8540 GPU is ready for licensing, and GT8525 GPU announced last year is already used by automotive and mobile customers. More details can be found in PowerVR Series 8XT product page.